Unicellular to multicellular: What can the green alga Volvox tell us about the evolution of multicellularity and cellular differentiation? 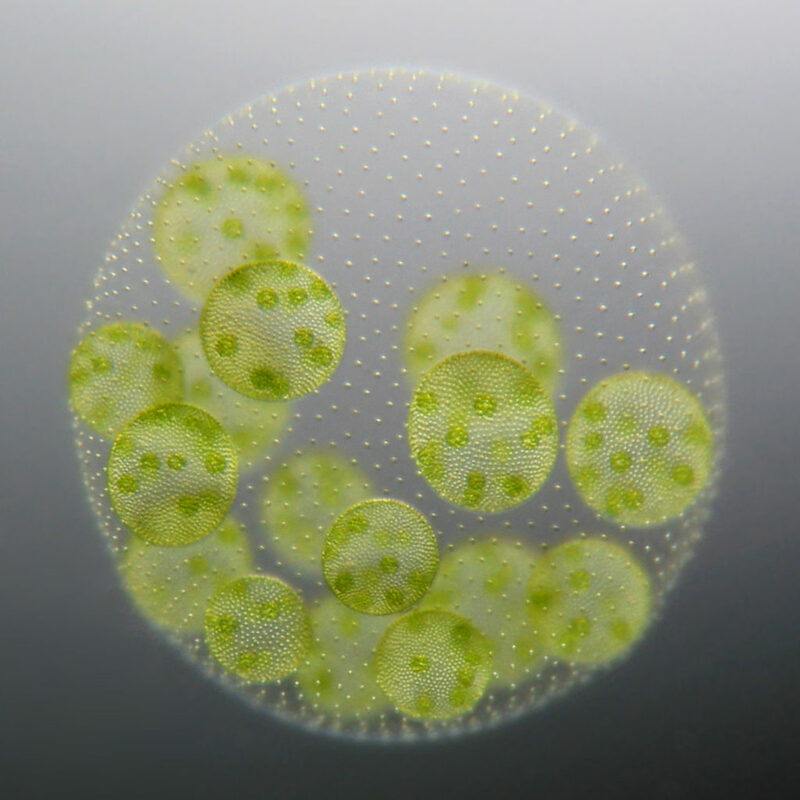 Despite being 2mm in diameter and only having 2 cell types, green alga Volvox have fascinated biologists for over 300 years and are a model organism for developmental, physiological and evolutionary research. Published today in BMC Biology new research analyzes the whole transcriptome of Volvox carteri by RNA sequencing. Here, lead author of the study, Armin Hallmann, explains how this impacts our understanding of evolution from unicellular to multicellular organisms. In unicellular organisms, all tasks to survive and reproduce have to be performed by one and the same cell because only one cell forms the entire organism. One of the greatest achievements in the evolution of complex life forms was the transition from unicellular organisms to multicellular organisms with different cell types. Because the step from unicellular to multicellular life was taken early and frequently, the selective advantage of multicellularity seems to be quite large. In multicellular organisms like humans, a large number of cells form a cooperating cell community with specialized cell types and a division of labor among the various cells. Finding out how unicellular organisms can develop into multicellular organisms over the course of evolution is a central issue in biological research. The situation appears different for volvocine green algae, such as Volvox carteri, in which multicellularity is a relatively recent innovation. What’s so interesting about the tiny, spherical green alga Volvox carteri in this context? Even though complex multicellularity evolved several times in eukaryotes, in most lineages it is quite challenging to investigate its molecular background because the transition happened too far in the past and, in addition, these lineages evolved a large number of cell types. However, the situation appears different for volvocine green algae, such as Volvox carteri, in which multicellularity is a relatively recent innovation. In terms of cellular composition, V. carteri is about as simple as a multicellular organism can be, yet it shares many features that characterize the life cycles and developmental histories of much more complex, higher organisms. V. carteri only has two cell types: 2000-4000 small, terminally differentiated, biﬂagellate somatic cells near the surface of the spheroid, and approximately 16 large, potentially immortal reproductive cells just internal to the somatic cell layer. More than 95% of the volume of such a spheroid consists of a complex, but transparent extracellular matrix. In nature, Volvox lives in freshwater ponds, puddles and ditches. With a diameter of up to 2 mm, you can even recognize the alga with the naked eye. Incidentally, the name Volvox comes from the Latin word volvere, to roll, and -ox, as in atrox, means “fierce”. Thus, in a nutshell, it is the ”fierce roller”. Since its discovery just over 300 years ago by Antoni van Leeuwenhoek, Volvox not only fascinated biologists but it also has long since become a model organism for developmental, physiological and evolutionary research. Its current status was also supported by the fact that Volvox has quite interesting relatives within the volvocine lineage. Several genera of this lineage can be arranged in a conceptual series according to increasing developmental complexity from unicellular Chlamydomonas, to colonial organisms without a division of labor, such as Gonium, Pandorina, Yamagishiella and Eudorina, to multicellular organisms with a partial or full germ–soma division of labor, such as Pleodorina and Volvox, respectively. In this series there are progressive increases in cell number, organismal polarity, volume of extracellular matrix per cell, size of adult organisms, and the tendency to produce sterile, terminally differentiated somatic cells. The evolution of multicellularity is also considered to be associated with the stepwise transition from isogamy to anisogamy/oogamy (sexual reproduction through fusion of gametes of similar size versus fusion of gametes of dissimilar size). Thus, the volvocine green algae and particularly V. carteri provide a unique opportunity to study multicellularity and cellular differentiation at the molecular level and to discover universal rules that characterize the transition to differentiated multicellularity. Sequencing of the nuclear genomes and comparison of genomic features of V. carteri and two of its relatives, Chlamydomonas and Gonium, revealed that a surprisingly low amount of genomic innovation seems to be required for the evolutionary transition from unicellular to complex multicellular algae. The genome of V. carteri was shown to have about fourteen thousand genes. The expression of these genes dictates how its cells function and, among quite a few other tasks, it regulates cell differentiation and the separation of germ and soma. Gene expression can be experimentally determined by measuring the amount of transcripts of a certain gene. If this is done not only for a single gene but for all genes at a time, it’s a transcriptome analysis. In a recent study published in BMC Biology, my colleagues and I analyzed the whole transcriptome of V. carteri by RNA sequencing (RNA-Seq). This allowed us to measure how strong the expression of each gene is or whether it is turned off. Because we separated the cell-types of Volvox before we did the analysis, we were also able to compare the expression of all genes between the two cell types, i.e., somatic cells and reproductive cells. Overview of our RNA-Seq analysis . Our results demonstrate a surprisingly extensive compartmentalization of the transcriptome between cell types: More than half of all genes show a clear difference in expression between somatic and reproductive cells. This high degree of differential expression indicates a strong differentiation of cell types in spite of the fact that V. carteri diverged relatively recently from its unicellular relatives. The analysis of cell-type specific gene expression also made it possible to provide new information about the expression pattern of previously investigated Volvox genes (roughly four hundred genes in number). 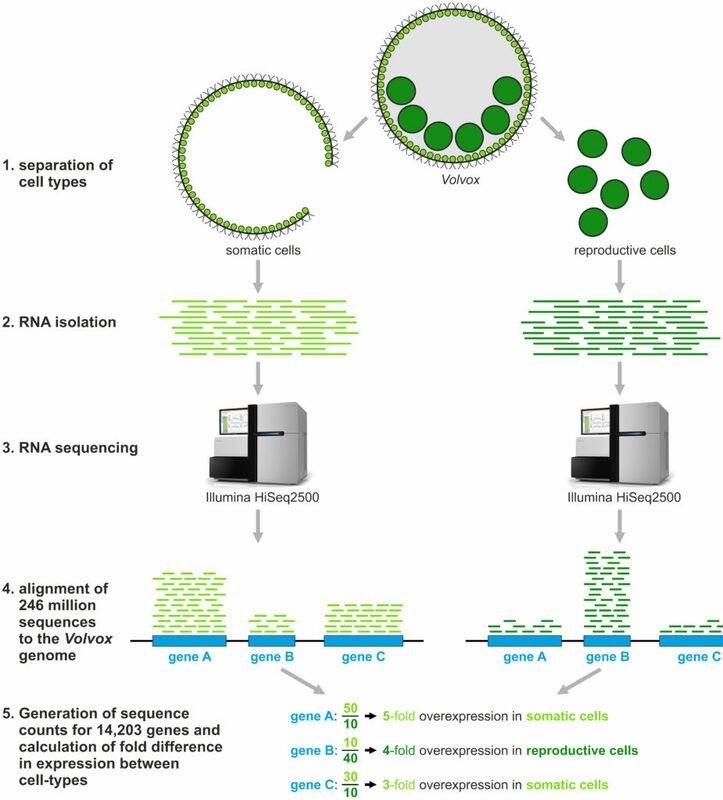 The analysis of the whole Volvox transcriptome of separated cell types is a major step towards understanding the molecular “toolbox” underlying the evolution from unicellular to multicellular organisms. In the long term, the study of molecular processes in simple organisms should lead us to a better understanding of the developmental history and key functions of far more complex life forms. Armin Hallmann is a Professor and Head of the Department of Cellular and Developmental Biology of Plants at the University of Bielefeld, Germany. His research focuses on the molecular mechanisms underlying the development and evolution of multicellular organisms with differentiated cell types. He uses green algae (like Volvox) as model organisms, which can be genetically modified to learn more about cellular and molecular processes. Further areas of interest include molecular mechanisms of light reception and phototaxis in green algae.